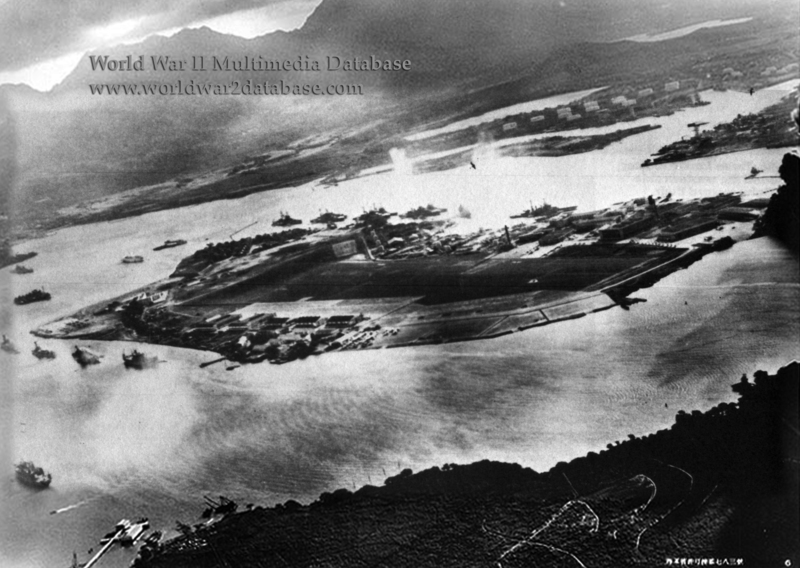 Captured photograph taken from a Japanese plane during the torpedo attacks on ships moored on both sides of Ford Island, the center of the photo. View looks about east, with the supply depot, submarine base and fuel tank farm in the right center distance. A torpedo has just hit USS West Virginia (BB-48) on the far side of Ford Island (center). Other battleships moored nearby are (from left): USS Nevada (BB-36), USS Arizona (BB-39), USS Tennessee (BB-43), inboard of West Virginia, USS Oklahoma (BB-37), torpedoed and listing, alongside USS Maryland (BB-46), and USS California (BB-44). USS Neosho (AO-23) is moored at an angle to Ford Island, between Oklahoma's and Tennessee's births and California. On the near side of Ford Island, to the left, are light cruisers USS Detroit (CL-10) and Raleigh (CL-8), target and training ship USS Utah (AG-16) and seaplane tender USS Tangier (AV-8). Raleigh and Utah have been torpedoed, and Utah is listing sharply to port. Japanese Nakajima B5N2 Type 97 torpedo bombers are visible in the right center (over USS Neosho) and over the Navy Yard at right. Japanese writing in the lower right states that the photograph was reproduced by authorization of the Navy Ministry. According to historian David Aiken, Akagi Airnan 1st Class Keigo Hanai is the pilot of the plane over Neosho. Hanai changed targets from California to the easier West Virginia because his navigator, Petty Officer 2nd Class Shigeharu Sugaya, was badly wounded; he died later that night. the other plane is a B5N2 from IJN Soryu starting its attack run down the Southeast Loch toward Battleship Row.